The 2011 Hottest 100 was the ninteenth annual Hottest 100 countdown since the change of the format which allowed only songs from the previous year to be voted for. The countdown took place in January of 2012 and featured a mixture of 70 different artists. 1,378,869 votes were counted in the countdown. Gotye and Kimbra's winning song marks the first time that either a duet, or a collaboration between two artists has topped the chart. Interestingly, it is the second time in a row that a female voice has graced the top of the chart, with a 16 year drought being broken the previous year by Angus & Julia Stone. At #3, Matt Corby becomes the third, and currently highest charting, Australian Idol contestant to feature in a Hottest 100. Lisa Mitchell and Owl Eyes (who also charted this year), achieved this in previous years. Architecture In Helsinki's appearance at #12 in the countdown marks the second time that songs from album have been featured in non-consecutive countdowns. In 2008, Architecture In Helsinki released their track 'That Beep' which was later re-released on their album 'Moment Bends' in 2011. While it is the second album to feature non-consecutively, it is the first album to feature more than 1 year after its original single release. Non-consecutive appearances also occurred in the 1997 & 1998 countdowns with Grinspoon, and the 2015 countdown, when The Wombats charted. Owl Eyes reached #28 with her cover of Foster The People's 'Pumped Up Kicks', which charted at #32 in 2010. Incidentally, in terms of single artists in the countdown, Dave Grohl has actually been the artist with the most appearances. As of 2011, Dave Grohl has been a part of 31 charting songs, through his work with Nirvana, Foo Fighters, Queens Of The Stone Age and Them Crooked Vultures. In second position, with 24 charting tracks, is Bernard Fanning, the frontman for Powderfinger. At #90, the Beastie Boys featured with 'Make Some Noise'. The song includes the line "We got a party on the left, a party on the right, we gonna party for the motherfucking right to fight". This is a reference to their 1986 song '(You Gotta) Fight For Your Right (To Party!)' which reached #38 in the 1998 All Time countdown. Additionally, the film clip for 'Make Some Noise' is considered somewhat of a sequel to the film clip for '(You Gotta) Fight For Your Right (To Party!)'. Mr. Little Jeans reached #100 with her cover of Arcade Fire's 'The Suburbs', which charted at #58 in 2010. 15 of the tracks in the countdown were by 12 different artists from Triple J Unearthed, a new record for a single year. 3 artists; Boy & Bear, San Cisco and The Jezabels made it into the top 10, which is the first time this has happened. The 2011 countdown also marks the first time since 1995 that the countdown featured no previous winners of a Hottest 100. 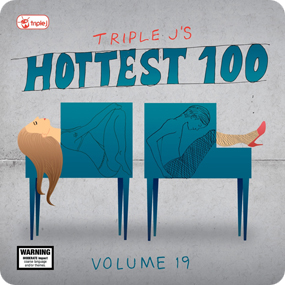 Once again, Triple J released the tracks that featured in the positions #101 to #200. For more information on those tracks, click here. Kimbra and The Wombats each managed 4 tracks in the list, with Kimbra's highest reaching #1 through a collaboration with Gotye. 360, Bon Iver, Boy & Bear, Florence And The Machine, Foster The People, Gotye, Grouplove, and Skrillex achieved 3 tracks each, while 12 artists each achieved 2 entries each. The 2011 Hottest 100 featured artists from 10 countries, including 44 from Australia, 24 from USA and 21 from England. ‘Somebody I Used To Know', at #1, was a collaboration between Gotye and Kimbra who are from Australia and New Zealand, respectively. However, the track is counted as an Australian entry for simplicity. ‘Bounce', at #30, was a collaboration between Calvin Harris and Kelis, who are Scottish and American, respectively. However, the track is counted as a Scottish entry for simplicity. ‘Cinema', at #39, was a collaboration between Benny Benassi, Gary Go and Skrillex who are Italian, English and American, respectively. However, the track is counted as an Italian entry for simplicity. ‘Wildfire', at #79, was a collaboration between SBTRKT and Little Dragon, who are English and Swedish, respectively. However, the track is counted as an English entry for simplicity. ‘Future Starts Slow' by The Kills, is listed as an American song despite the band being made up of Alison Mosshart from America, and Jamie Hince from England. Since Alison Mosshart is the frontwoman and most vocal member, it is listed as an American song.